Wow, what a weekend! Today I was meant to be catching up on replying to emails and sorting out the house. Last week I managed to create a mess in almost every room with my market prep. And today I still have my car boot full of things that need unpacking and a house that needs tidying. I have folded and put away half my fabric stash that was piled on the dining table and I've done a few loads of washing and had a pretty lazy day really... bliss after the last few weeks. This is one of the things I was working on last week: a new design that I had printed on fabric to make some Festive Craft Kits. 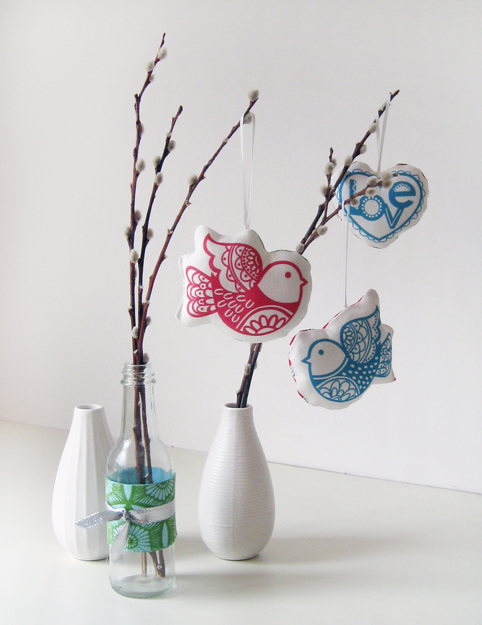 I really enjoyed the change designing these birds and the heart in a single colour and in a very graphic style, and I love the result. 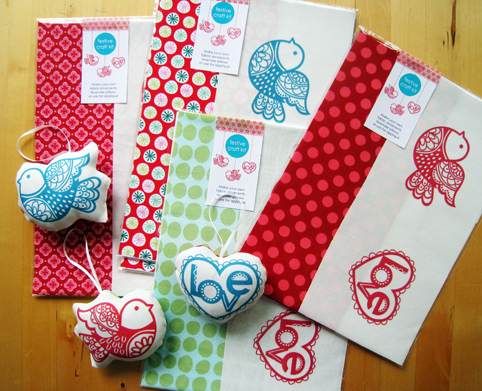 Each kit contains a printed fabric panel with 2 birds and a heart, and a piece of fabric (not my design) to use for the back of your fabric ornaments. They would look fabulous embroidered - I'm hoping to do some on the weekend. The kit can also be used to make pin cushions, lavender pillows, or for appliqué panels on an apron, quilt or Christmas stocking, etc. I'm going to give some to friends as part of their Christmas presents - they make great stocking fillers too. The kits will be available tonight are available now in my shop for just $12. I have limited stock left over from the markets, so if you'd like to buy one go have a look in a few hours now. Now for the giveaway part - I have 4 kits to give away. Just leave a comment on this post before the weekend and I'll draw the winners at random. If you've handmade anything for Christmas gifts this year please do tell.